Preheat oven to 350°F. Mix all ingredients except chocolate chips. When blended, mix in the chocolate chips. Using your hands, form 1 1/2-inch balls (dough will be very wet and sticky) and place onto an ungreased parchment lined cookie sheet. Don't make them too big because they do spread. You should have about 12 balls when finished. Bake for 9 minutes. Let the cookies sit on the cookie sheet for aobut 30 seconds to 1 minute before removing them to cool on a wire rack. Cookies from scratch don't have to be time intensive. 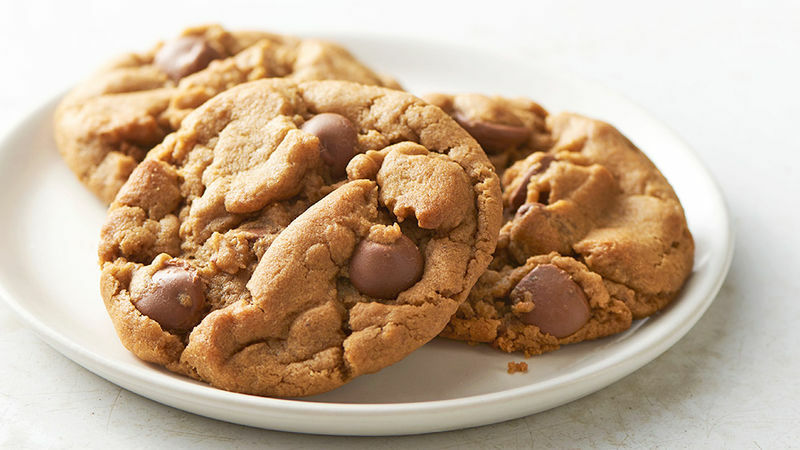 You can get that homemade cookie taste with these easy 5-Ingredient Peanut Butter Chocolate Chip cookies made from ingredients you most likely already have in your pantry. You can literally throw these flourless, protein-packed, peanut butter chocolate chip cookies together in under five minutes. Perfectly chewy and melt-in-your-mouth, these cookies are quick treats you can whip up in minutes. Great for the holidays when you may need a treat in a pinch.